ST. CLAIR SHORES, Mich- Whether you are traveling solo or have filled up all 7 seats, the 2013 Ford Flex will keep you connected and comfortable. In the drivers seat stay connected with to calls and music. As a passenger enjoy the unmatched 2nd and 3rd row space with extra leg and headroom. The Flex is ahead of the game with its advanced technology. The rear camera helps improve your view while reversing. Moisture activated wipers go to work as soon as it begins to rain. In the winter there is no need to worry about snow build up on your side-view mirrors as these mirror are heated. The revolutionary Ford Flex keeps up with its reputation of being innovative and modern. Get going at the push of a button, without even using a key. With the moonroof that glides open every seat has an all around view. The fixed glass panels are located over the 2nd and 3rd row seats and slides to open up to large sky view. If you need more storage room, folding the 3rd row seats down is so easy with PowerFold at the touch of a button. The 2013 Flex is all-around luxury, even on long trips you will be comfortable. Even keep your beverages cool on the go. Stop by your local Ford Dealer Serving New Baltimore, St. Clair Shores and surrounding communities. 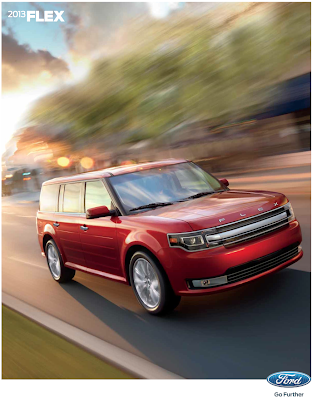 Learn more about the 2013 Ford Flex in our Brochure. Family owned and operated since 1946, Roy O'Brien Ford is located at 22201 E. 9 Mile Rd. St. Clair Shores, MI 48080 for all your local Ford dealership needs. Stay on the right track to Nine Mile and Mack!